You can embrace Madrid’s terraza culture almost any month of the year. 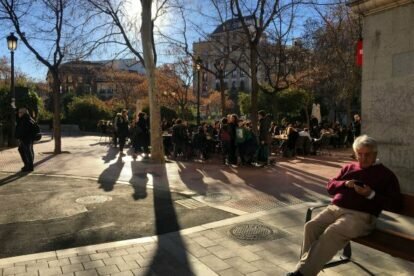 Spain delivers when it comes to a good climate, and sitting outside and enjoying it is one of the many things I love about living here and La Plaza de Olavide is one of my favourite spots for doing just that! Olavide is a round square that features lovely planting, plenty of benches, a cooling fountain and several playgrounds for children with all the usual slides, swings and climbing frames. It is leafy, pedestrianised and completely circled by bars and restaurants with large popular terrazas. It can be easy to spend a lot of money when you are on holiday, so I think finding some cheap and cheerful places where you can spend a few hours without spending a fortune is always welcome. Classic sharing menus, such as a large mixed salad and a whole potato omelette are a good deal, for example. Add a some “tinto con casera” (red wine and white lemonade) to the mix, and you’ll be all set for lunchtime like a local in Spain’s capital! Recently the streets radiating off it have been partly pedestrianized, and it’s looking very smart. I took the accompanying photo on January 25 and as you can see, the weather is beautiful and the outdoor cafe is full of locals soaking up the sun!